Many people in different periods of their livesCollect a variety of things, it can be magnets with city emblems, beautiful wine glasses, figurines, etc. But sometimes we like to collect what is considered to be "Garbage"And discard immediately after use. 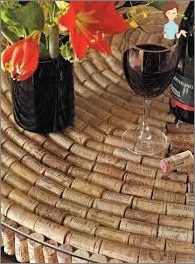 In this category fall and plugs from wineBottles, from which, as it turns out, you can make very beautiful, unusual and useful things in the household, and with their help you can make a decor for any room. 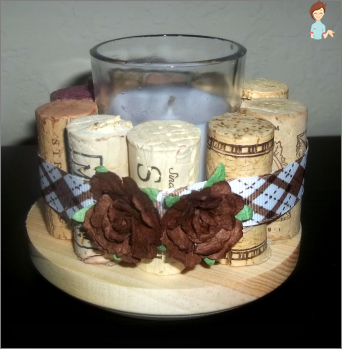 Crafts made of corks made with their own hands will definitely decorate your house, bring a zest to its interior and become excellent helpers in the economy. If you have a lot of this in your house "Garbage", There is a certain amount of free time and a great desire to make something happen, you can safely get down to work! First you need to determine what dimensionsWill have your rug, and prepare the right size of a piece of rubber litter or any other non-slip water repellent material. It is also important to calculate in advance the necessary number of plugs, so that in the midst of the work it does not turn out that you need to get some amount of blanks somewhere urgently. To make such calculations is very simple: The most common plug from a wine bottle has a size of 2.0 * 3.5 cm, by simple arithmetic calculations it is possible to determine exactly what number of elements will be needed to make a rug of the specified size. So, on a rug measuring 40 * 60 cm you will need about 170 pieces. After all the calculations have been madeStart preparing traffic jams. They need to be cut in half along with a sharp knife and a cutting board, after which the sections are sanded with sandpaper. They may differ slightly in size, but this should not be frightened in the course of their work, if necessary, they will be "Fit". When all the blanks have already been cut and cleaned, the "Fitting"- put one vertical and horizontal row of plugs along the edge to assess whether they fit well in the given dimensions of the future mat. If everything suits you, you can start sticking. Fastening of cut blanks to the baseYou need to start around the perimeter, this will create an even edge of the rug. Even if inside they do not lie perfectly, you can always cut them. Apply the adhesive evenly on the flat part of the workpiece, put it in place and press it firmly against the base. You can arrange the workpieces in even rows inOne direction, and you can - perpendicular to each other - everything will depend on your imagination. When all the workpieces are laid, you can consider the mat ready, only before the start of its operation it is necessary to allow time for the adhesive to dry completely. You can make a similar work of cork fromChampagne is only necessary to cut the cork transversely in such a way that as a result of it you get two different in diameter, but equally high in the circle. Making hand-made articles from cork by oneself is an interesting and fascinating process, which can result in useful and useful things, such as a jewelry box. You can use a small boxSize, for example, from children's shoes, but it is better to make it yourself from cardboard sheets in such a way that the box and its lid are equal in circumference and closed "At the junction", but not "Lapped". The box and cover must be pasted with sackcloth on all sides and glued together "At the junctionOn one side, so that it looks likeThe casket. For gluing it is best to use PVA glue, it not only perfectly glues the materials, but also makes the box stronger. Now the box, pasted with burlap, should be left for a while, so that the glue is completely dry. In the meantime, you need to prepare traffic jams: Cut them along in half and clean the cuts. The crumb formed during the cutting process must be assembled - it is still useful. When the burlap on the box is completely dry, you can begin to glue the box with blanks using an adhesive gun. Cut off along the corks it is necessary to glue only the sides of the box and the lid, with solid, even horizontal rows. Bottom and cover the box pasted only around the perimeter. The surface inside this perimeter must be covered with stoppers cut into slices. When pasting the lid, it is first necessary to place in the center the stoppers from the champagne, which will serve as handles of the casket, and then spread around them "Wine»Circles. The remaining space between them is covered with crumbs. In the end, the entire surface of the box must be covered with acrylic lacquer. In addition to the rug and casket can be madeA lot of various useful things. 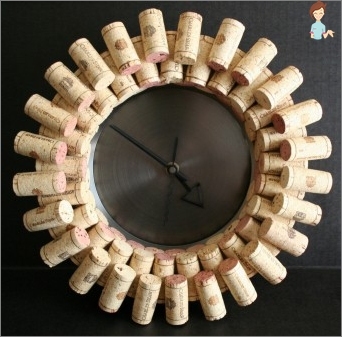 This can be crafts made from wine corks for children, for example, boats, doll houses, toy furniture, etc. In addition, you can make such a necessary piece of garden plugs, as a comfortable chair in which you can relax on summer evenings. Fantasize, creatively, use your talents and then you will get original and exclusive things! Enjoy your needlework!